The apartment hotel is located close to the new Leipzig Exhibition Centre (trade fair dates can be found at the bottom of this page), only 25 km away from the airport and 6 km away from Leipzigs famous main station and city centre. 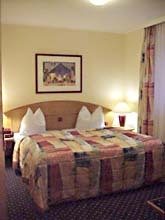 Ideally located when approaching from the A9 and A14 motorways. The modern hotel complex in the eastern part of Leipzig offers 144 first-class apartments. You can choose between 3 different types of apartment. 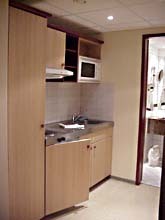 The apartments have a separate bedroom, comfortable living area and a fully fitted kitchen unit. 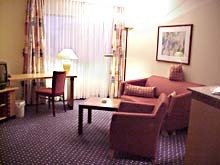 Due to the stylish furnishings, long-term guests dont have to forgo any comfort. Not far from the apartment hotel, you will find a wide range of sports and leisure facilities like whirl and swimming pools, sauna, tennis, fitness as well as  for shopping lovers  the Paunsdorf-Center, one of the largest shopping centres in Germany (80,000 m² with over 120 shops). The Studio-apartments (approx. 37 m²) have a living room/bedroom with a kitchen unit with fridge, cooker, microwave and coffee machine and an extra bathroom. The apartments are really perfect for as many as two people. The small apartments (approx. 47 m²) have a living room with a sitting area, a double bed in the bedroom, a bathroom as well as a kitchen unit with fridge, cooker, microwave and coffee machine. The settee in the living room can also be used as a bed. It is comfortable for an additional guest. But the apartments are really perfect for just two people. In addition to the small apartments, the large apartments (approx. 59 m²) have a 40 m long roof-terrace and a walk-in wardrobe. The living area of the 67 m² suite consists of two connected living rooms (no door). There is a conference table which seats up to 6 people, a desk, a television and air-conditioning. The Venetian blinds darken the room  if desired. The bathroom has a bath tub. The prices are for 1-2 people. An extra charge of 10 euros per night has to be paid on top of the normal price for an additional guest (max 3 guests per apartment are allowed). An additional 20 euros have to be paid for cleaning services. arrival on : 8 a.m. - 4 p.m. 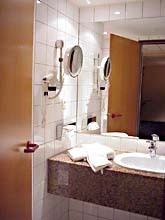 This apartment hotel made available by Privatzimmer Sens, Agency for holiday apartments and guest rooms in Germany.